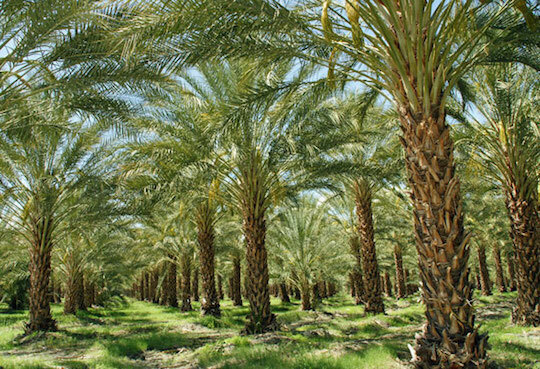 The date palms of the Coachella Valley are something approaching sacred to me. 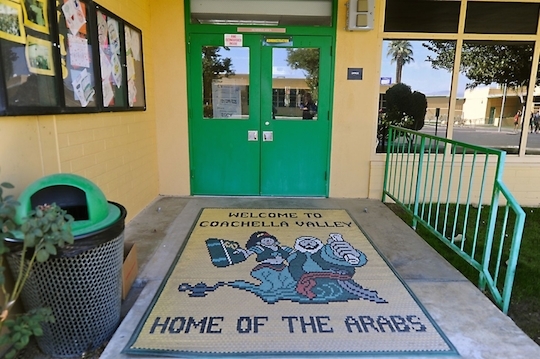 Between 1973 and 1977 I spent three stretches of time in the Coachella Valley, south and east of Palm Springs, working on strikes and organizing drives with the United Farm Workers. 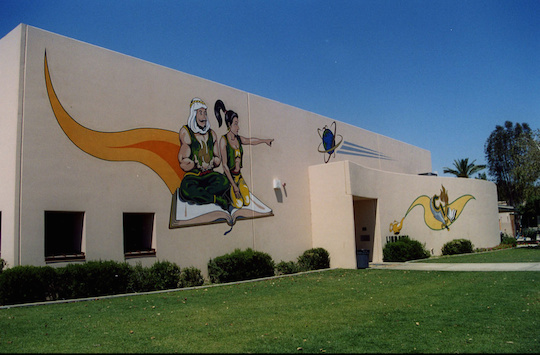 Between 1975 and 1980 I made the drive between Salinas and Calexico many, many times. 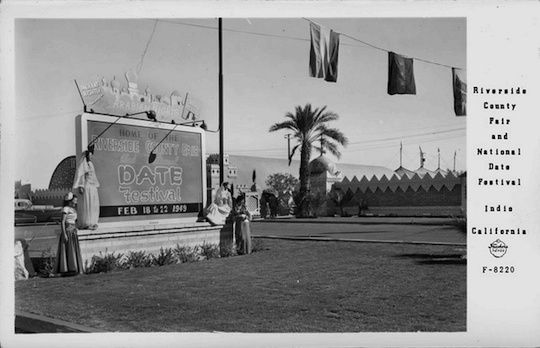 I often stopped at the UFW office in Coachella to see friends (especially one), scrounge food, and trade Union gossip. 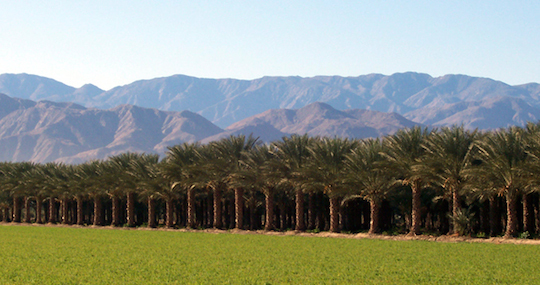 There were 7,000 acres of grapes in the Coachella Valley. 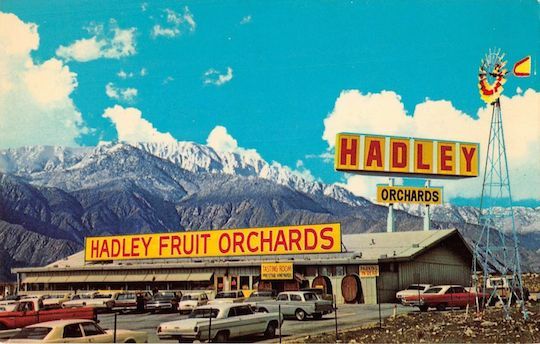 The harvest started in June, and in an era before globalization of the fresh fruit industry, Coachella grapes were the first fresh fruit of the year in supermarkets. 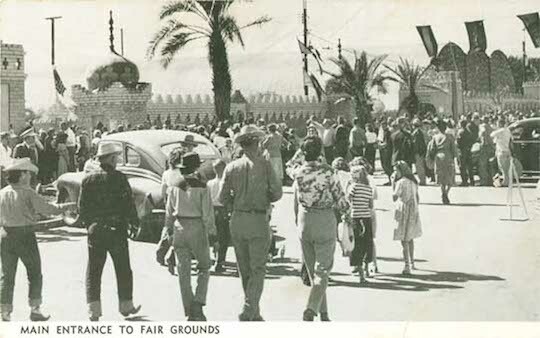 Much of what was planted in table grapes then is gone now, given way to housing and golf courses. Along with the grapes were citrus and dates, sometimes interspersed. The citrus gives a completely magical scent to the air in the spring, day and night. 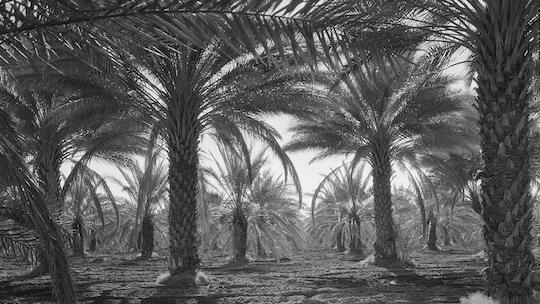 The date palms soar, and the sunlight is dappled coming through them. Other-wordly. 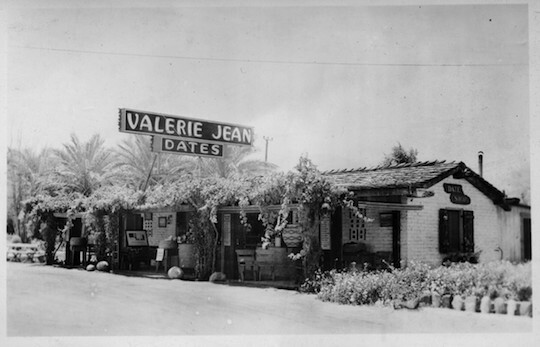 There were date businesses throughout the valley, little family-owned shacks like Valerie Jean’s in Thermal selling fresh dates and date shakes – milkshakes made with date ice cream. Sweet much! My friend Esperanza Sauceda worked at Valerie Jean’s. 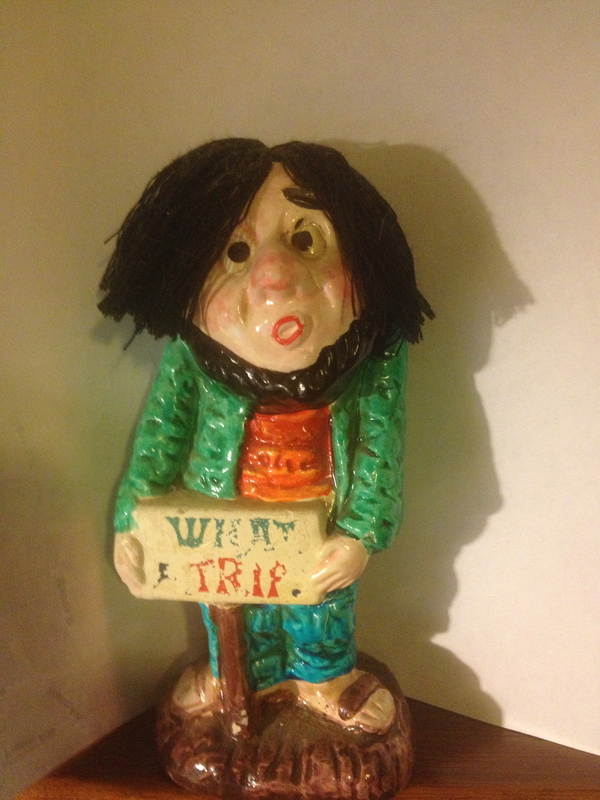 She sent a huge Valerie Jean’s gift basket of assorted dates to my family in Pennsylvania in December 1974 when my sister Jeanne got married. 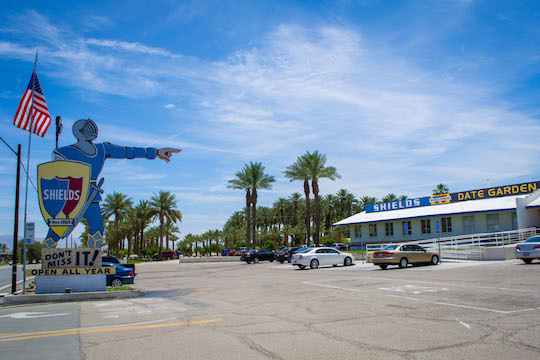 Most of them are gone, but Shield’s is still there, much as it was then, in Indio. 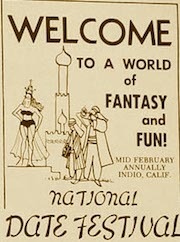 Old weird America! 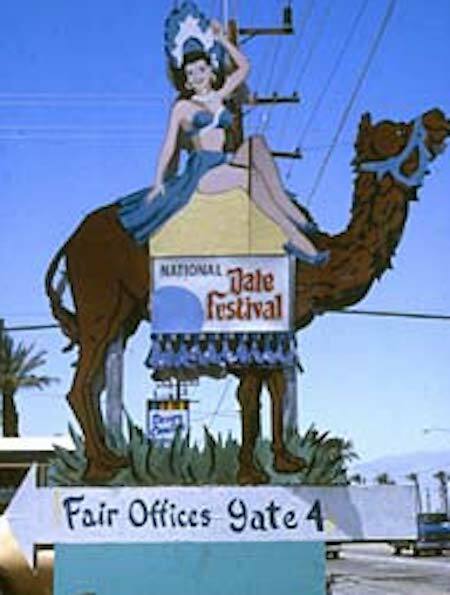 In the early spring there is the Riverside County Date Festival at the fairgrounds in Indio. Oh my! 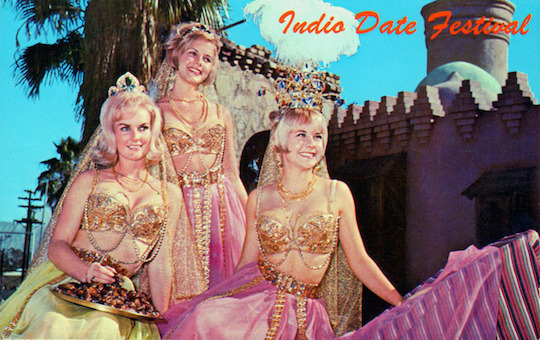 Gabby sent me his small collection of Date Festival postcards. 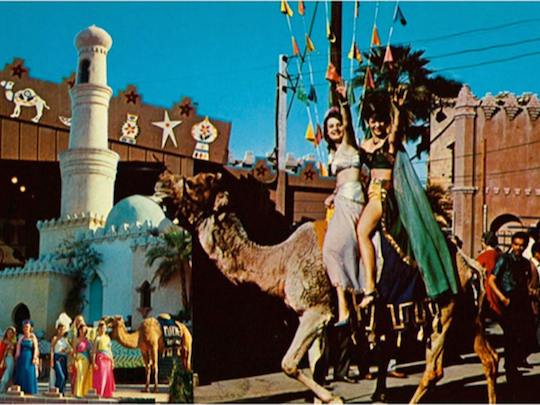 I went to the festival for a few years in the mid 1970s. 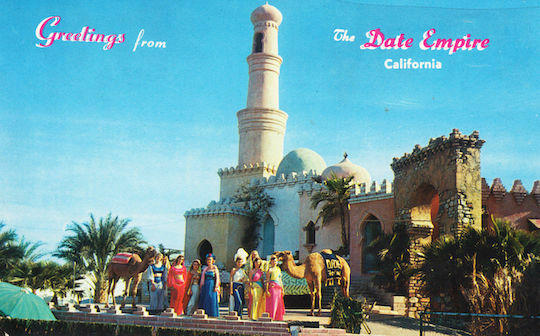 I loved the dates, of course, and the camel races and ostrich races. 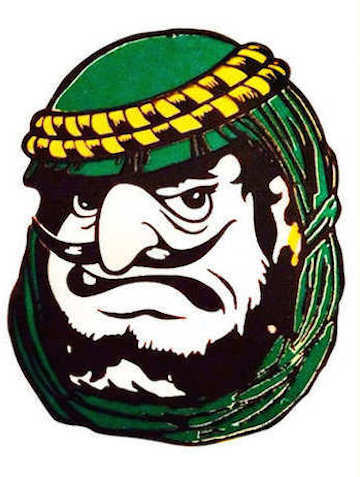 But of greatest fascination is the depiction of the Arab world from the time before Arabs became an enemy. 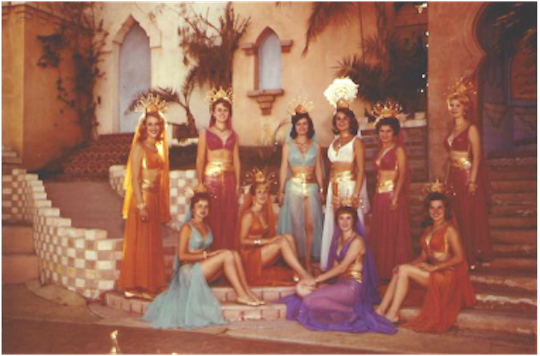 They were just exotic. 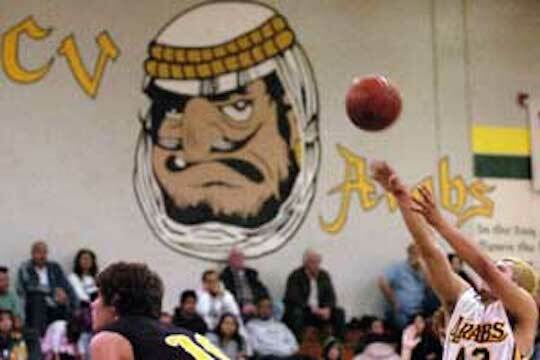 There is nothing like white people dressing up like Arabs. 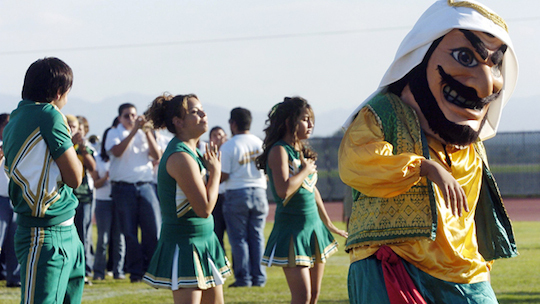 And, speaking of stereotypes, how about the Coachella Valley High School mascot? 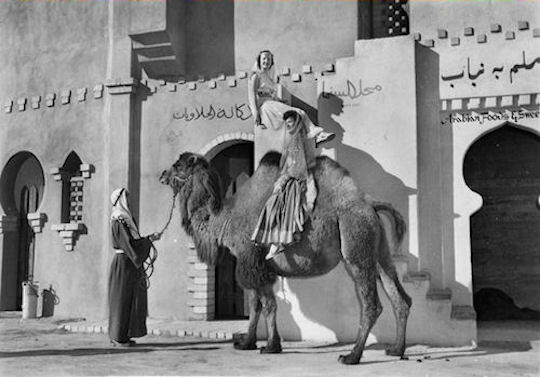 They are the Arabs, and have been since the 1930s. 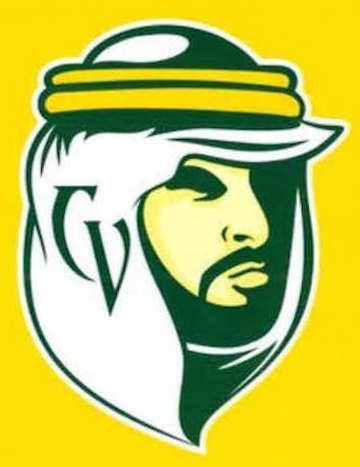 After 12 years of protests and debate and agonizing about the mascot, in 2014 the Arabs became the Mighty Arabs, with a kinder and gentler looking Arab as the mascot. 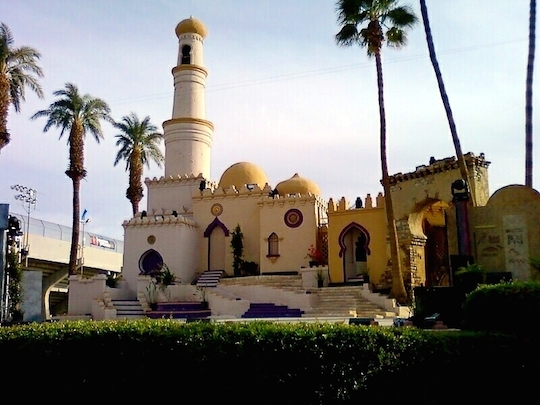 I visited Coachella in December, 2014 with two friends from my current work. 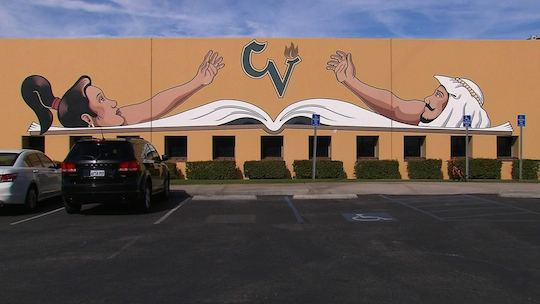 Oh dear – the Valley has changed drastically, but if you get far enough south and east the gritty reality of rural California poverty sets in. 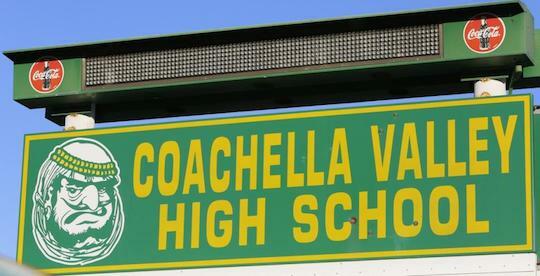 Coachella itself isn’t so different from what I knew. 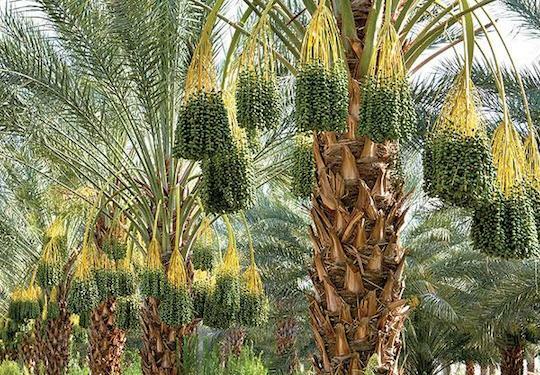 And the dates – still lots of them there. 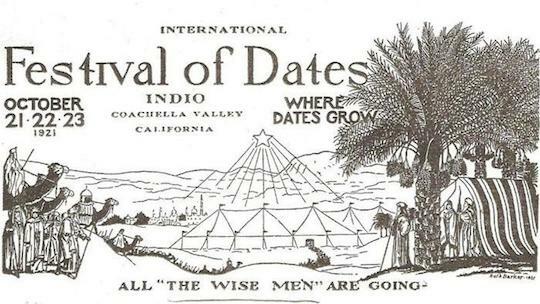 My sense of wonder at the date palms of Coachella survives. I am no longer the 21-year-old freshly arrived from California living in the midst of the impossible dream that the United Farm Workers was, and it may be that the passion I feel now is a pale remnant of the passion of those years. I’m not sure though. It burns pretty bright now. I showed the photos to my friend. He had a chuckle or two. “That’s another story for another day.” He accepted this answer. I returned to the original question that I had posed – what did he think of the photos?